Apathy Noir (formerly Apathy) is a Swedish progressive doom/death band, consisting of Viktor Jonas (all instruments) and Mattias Wetterhall on vocals. 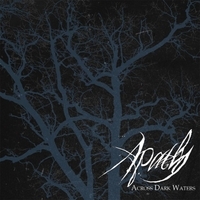 Across Dark Waters is the project’s third album and it is easily the band’s most accomplished and varied album to date. Across Dark Waters is also something of a concept album, telling the story of a shipwrecked fisherman and his encounter with three deadly sirens. Across Dark Waters blends the lilting melodies (in this case there’s a definite early Katatonia and My Dying Bride influence) with death growls. But unlike some of their peers in doom/death, Apathy Noir are decidedly more doom than death, the growls being the exception. They’re serviceable, but the mournful, melodic guitars, violin, keys, and crooning clean vocals drive this album. There’s an ethereal, elegant quality to Across Dark Waters that comes across very well. The album’s other driving factor is the story; Across Dark Waters is one of those albums that benefits from having the lyric sheet close at hand. This is a successful concept album in the sense that the story is integral to the music, and both combine to give the album an ominous, foreboding atmosphere. Progressive elements are also a large part of the sound on Across Dark Waters. Sudden shifts from light to dark and soft to heavy are common, although the band is content to stay mostly a stately doom tempo most of the time. Some of the songs are a little meandering, not to the point of being clunky, but just slightly disjointed. Partly it seems the result of the concept album and the band needing extra musical space to flesh out the story. And it’s only a problem in spots on the album; when the band fires on all cylinders, as on the opener “Beyond the Sea” and, the densely layered melodies on “Death of Hope” and the massive “The Village” the results are excellent. The album is also a little long for me at over an hour and I also wish the band incorporated more clean vocals, as they’re quite well done. These minor issues aside, Across Dark Waters is a solid album for fans of doom/death. It’s a massive leap in songwriting from the band’s previous material and manages to be both a compelling story and contain a solid batch of songs. Between it and In Mourning’s Afterglow it has been a solid spring season for progressive doom/death. This entry was posted in Death Metal, Progressive Metal, Reviews, Stoner, Doom, Sludge and tagged Across Dark Waters, Apathy Noir, Artnoir Productions, doom/death, katatonia, My Dying Bride, Progressive Doom/Death, Swallow the Sun.